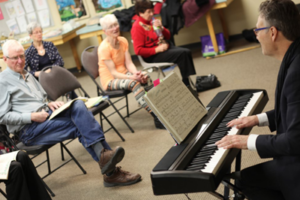 Sharing a love of music and new Parkinson’s research on singing and the brain. 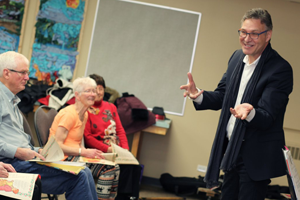 Brian leads the Parkinson's Singing Program for Parkinson's Alberta in Calgary. Research indicates that singing can help improve speech and voice challenges commonly associated with Parkinson's disease. Brian inspires participants through singing, humorous stories and movement. Singing experience not required. All are welcome. Visit the Parkinson's Alberta website to register. Singing is a culturally universal pastime that improves bonding and produces a sense of belonging that traditional therapies often cannot match. Additionally, singing can be considered an elongated type of speech with particular emphasis on rhythm, tempo, tonal changes and respiratory control. “I think Brian is great. With his vast experience, knowledge of performers and musical style, he was able to share with us in a way that made it fun and memorable”.